A Texas company will submit a report by June on whether a company controlled by RIL 'stole' natural gas from the wells where ONGC is contracted to operate in the KG basin, as alleged by ONGC. Paranjoy Guha Thakurta and Jyotirmoy Chaudhuri report on the twists and turns in the case. An unprecedented dispute between India's largest public sector company, the Oil and Natural Gas Corporation, and the country's biggest private company, Reliance Industries Limited, over allegations of theft of natural gas worth nearly $5 billion or Rs 30,000 crore (Rs 300 billion) from the Krishna-Godavari (KG) basin levelled by the former against the latter, is likely to be resolved in coming months. An 'independent' foreign firm will examine the veracity of claims and counter-claims that have been made. Before the firm's appointment to make a technical assessment of the claims of theft of gas, there was intense pressure and considerable heartburn over the choice of the international agency to act as an arbitrator of sorts to resolve the dispute. On November 26, Minister of State for Petroleum and Natural Gas Dharmendra Pradhan told Parliament that DeGolyer and MacNaughton (D&M) based out of Dallas, Texas, in the US, will submit a report by June 2015 on whether a company controlled by RIL 'stole' natural gas from the wells where ONGC is contracted to operate in the KG basin, as alleged by the government-owned company. It is learnt that both ONGC and RIL had begun sharing data with D&M from September 25 onwards. The US firm was selected from four companies that had been short-listed by the two Indian companies to resolve the dispute. The public sector undertaking had said it wanted a 'truly independent' agency to examine its contention that RIL may have drawn natural gas worth up to Rs 30,000 crore (Rs 300 billion) from ONGC's fields adjacent to the ones in the KG-D6 block where a contracting company controlled by RIL operates. ONGC sought compensation from RIL if the allegations of theft were found to be true. Its counsel, Dushyant Dave, said that ONGC could seek over Rs 25,000 crore (Rs 250 billion) by way of compensation. In its petition, which was filed a day before the results of the 2014 national election were announced on May 16, ONGC named the MoPNG and its technical wing, the DGH, as respondents on the ground that these government bodies had failed to be vigilant in taking precautionary measures which had led to the PSU losing huge sums. ONGC said in its petition that the management committee, which had two government representatives and was in the possession of data from RIL, should not have cleared the company's plans to drill wells so close to the ONGC blocks. The public sector company also accused the government and RIL of not having followed the mechanism internationally accepted for joint development, clearly provided in the production sharing contract signed between the MoPNG and RIL. Since the blocks were adjacent to each other, under the provisions of the PSC, they should have been jointly developed by the two companies. 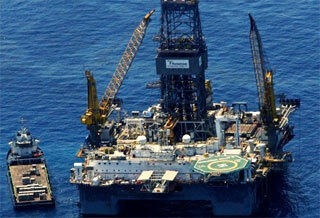 ONGC's decision to move court on May 15 surprised many. 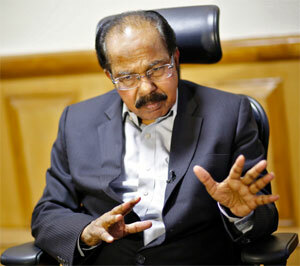 The company was under pressure from day one with the outgoing minister of petroleum and natural gas in the United Progressive Alliance government, M Veerappa Moily, shooting off a note to Petroleum Secretary Saurabh Chandra calling for an enquiry as to why ONGC had dared to initiate legal action against its biggest shareholder. Roughly 70 per cent of ONGC's shares are owned by the Union government through the MoPNG. Moily's note, dated May 22, was written almost a week after the UPA government was voted out of power in the general election and just four days before Narendra Modi was sworn in as prime minister on May 26. In a statement dated May 15, RIL said all its petroleum operations had been undertaken in accordance with the PSC and the development plan approved by the MC which had government representatives holding veto powers. It added that all well locations and their profiles had been specifically reviewed and approved by the MC. Moreover, RIL stated that there had been 'constructive engagement' with ONGC on sharing of data and on appointing an "independent third party expert" at a meeting held on May 9. In its reply to ONGC's suit filed on May 28, RIL said that according to the understanding it had reached on May 9, ONGC was to circulate a draft of the 'enquiry' to be sent to the four agencies shortlisted to RIL and DGH. The four names of the firms were to be finalised on May 23 and thereafter, the enquiry would be sent to the expert agencies for their responses. It is reliably learnt that at least two independent directors on the board of ONGC, including Deepak Nayyar and Arun Ramanathan, were keen that the company seek legal avenues to redress its grievances and protect its commercial interests. These members have since ceased to be a part of the board as their terms have ended. Sarraf had replaced Sudhir Vasudeva as the head of ONGC on February 26 after a proposal to give an extension to the latter, that had been moved by the then petroleum minister Moily, was rejected by the Appointments Committee of the Cabinet headed by then prime minister Manmohan Singh. Moily's attempt to grant Vasudeva an extension of term had been opposed by the then spokesperson of the Bharatiya Janata Party Nirmala Sitharaman (who is now minister of state for industry and commerce) and former member of Parliament belonging to the Communist Party of India Gurudas Dasgupta (who is one of the petitioners in a public interest litigation against RIL that is being heard by the Supreme Court). Both Sitharaman and Dasgupta wrote to Dr Singh saying they opposed Moily's move to extend Vasudeva's term because an enquiry by the Central Vigilance Commission was pending against him. In its May 23 statement, RIL sought to portray a level of trust and cooperation between it and ONGC. 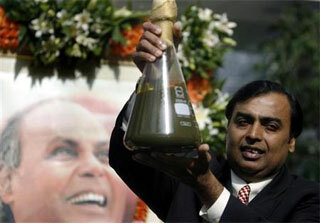 RIL stated that in view of techno-economic challenges in developing discoveries in its two blocks, ONGC had approached it in mid-2012 to examine the possibility of sharing RIL's infrastructure so that it could commercialise gas discoveries, some of which were discovered more than 13 years ago. In July 2013 the two companies had entered into a memorandum of understanding following which RIL had been providing relevant data and resources to assist ONGC develop its resources. RIL also stated that it was only in August 2013 that ONGC brought the issue of possible connectivity between gas reservoirs being worked on by RIL and ONGC to the notice of the former through DGH. Thereafter, as per international practice, ONGC and RIL had been engaged in appointing an independent agency to investigate possible reservoir connectivity across undersea gas blocks. The MoPNG and DGH filed a counter-affidavit in the dispute in August claiming that the allegations of ONGC were 'frivolous', that their issues had been looked into and sought dismissal of the petition. The 70 per cent owner of ONGC was, in effect, stating that its offspring should not have gone to court alleging theft of gas by RIL. The MoPNG said that ONGC had not raised any 'issue on connectivity of reservoirs and channels' when the mining lease of G4 block was granted to it six years earlier in 2008 nor when production of gas from the KG-D6 block by RIL started in April 2009. The MoPNG said ONGC's writ petition had become 'infructuous pursuant to the appointment of the independent agency', that is, D&M, on July 3. The fact that D&M would be chosen as the independent agency to resolve the dispute between ONGC and RIL had been first suggested in a July 16 report in the Hindu Businessline. Out of four firms shortisted, there was a second shortlist, of D&M, and Gaffney, Cline and Associates (GCA) which, like D&M, is also based in Texas. Although D&M had apparently been selected, there was speculation in the media about which firm would be selected. For instance, on June 22, PTI claimed that GCA was 'likely' to be appointed. Cautioning the government against hiring GCA, on August 28 Sarma filed an intervention application in the Delhi high court on ONGC's petition against RIL, alleging that the public sector company was being 'pressurised' to withdraw its writ petition. In an additional affidavit filed on October 18, Sarma alleged that GCA cannot qualify as a 'truly independent' agency since the company had been appointed by RIL to assess the gas reserves in KG-D6 block and that GCA had 'overestimated the reserves' of the block held by RIL. A report by Karvy Stock Broking Limited dated June 15, 2009, quotes a June 2006 press release from Niko Resources of Canada (RIL's junior partner in the consortium that has been contracted to extract gas from the KG basin) stating that GCA had 'upgraded' KG-D6 block's estimate of reserves, more than doubling these to 27.2 trillion cubic feet (tcf) from an earlier estimate of 11.7 tcf. A highly placed official in the MoPNG claimed that GCA was likely to be appointed as the agency chosen to resolve the dispute between ONGC and RIL. But that was not to be. When contacted, ONGC Chairman Sarraf declined to comment on the dispute on the ground that it was sub-judice. A source close to him claimed that deliberations were "too sensitive" at present and that ONGC was under "considerable pressure" to resolve the dispute amicably and out of court. There is one section within the government that is keen that ONGC withdraws its petition from the Delhi high court. Senior advocate Dushyant Dave told the writers of this article that after initially appearing in court for ONGC, he had not been subsequently briefed by the company's advocate-on-record. A set of questions e-mailed to an executive in the corporate communications division at RIL on November 17 remained unanswered till the time of writing. Paranjoy Guha Thakurta and Jyotirmoy Chaudhuri have co-authored with Subir Ghosh, Gas Wars: Crony Capitalism and the Ambanis, published in April 2014. 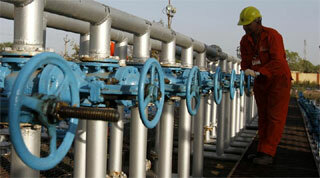 Is Reliance 'stealing' gas from ONGC's block?